The Burlington, or bell, style cistern is only suitable for high level cisterns and is now considered old fashion but can still be found in old houses or houses refurbished to be true to the Victorian age. These cisterns are normally made from cast iron and are easily recognised by the 'well' in the base into which the 'bell' sits. The flow-down pipe to the Lavatory pan is positioned within the bell with the open top just above the normal cistern water level. 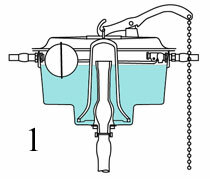 When the cistern chain is pulled, the lever at the top of the cistern lifts the bell drawing the water under the bell upwards into the top of the open flow-down pipe, once the water starts down the pipe, it starts a syphon effect drawing the rest of the water from the cistern until air is drawn under the bottom of the bell. If the water level is set too low, they can be temperamental in operation as if insufficient water goes down the pipe when the chain is pulled, it will not start the syphon effect. 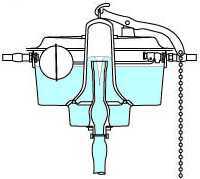 Low water levels can be remedied by adjust the float controlling the water inlet valve as described on the 'Common problems with lavatory cisterns' page. Burlington bell style cisterns tend to be mechanically noisy as the top lever pivots and lifts the cast iron bell. Although there are these drawbacks, using a well set-up and preserved Burlington bell style cistern in the appropriate position does add style without compromising on modern living.